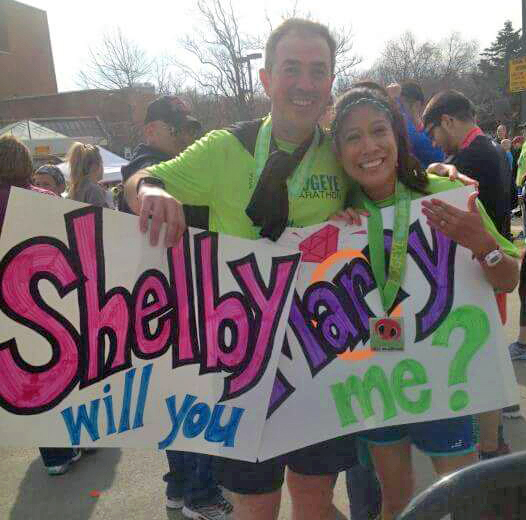 Last year, we asked Shelby a few questions that will help you get to know her better as a runner and as a #HogeyeHopeful. Thanks for chatting with us, Shelby! I started REALLY, seriously running January 2014. Before that I mostly ran/walked 1-2 miles to help relieve stress, and stay in shape. I started taking it more seriously because my now fiance was into running marathons. He kept talking about how amazing it made him feel. So I ran a New Years Day 5K, and that day I decided I wanted to train for a half marathon! We made the Hogeye Half Marathon my goal race. I love running anywhere! Trail runs lately have become my favorite. Hobbs State Park and Mt. Kessler, the Fayetteville trail system and even running in my hometown of Siloam are all places I enjoy! My “I’m a runner moment” came towards the last part of the Hogeye Half when I finished running up the last hill towards the finish line. I hadn’t run 13.1 miles before and I knew I was about to be done. I caught myself letting out a big sob, and made myself not cry like a baby because I didn’t want ugly finish line pictures!! It was such an unforgettable feeling of accomplishment. 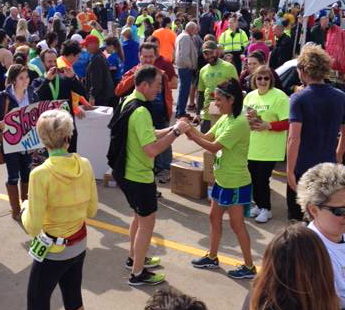 What also made the Hogeye even more unforgettable — besides being my first half marathon — was my then boyfriend, now fiance, Jeff proposed immediately after we received our medals. My medal was precious to me, but the ring and proposal was beyond what I thought was one of the happiest, most exciting days of my life! Looking back at training last year and this year my best advice would be to NOT skip the short runs, and don’t give up even when hills are so obviously not your friend. I enjoy running alone and with people. Running alone allows me to think and regroup from being a busy nurse and mom. Running with someone makes the long runs go by faster though and SOMEONE needs to take the running pics! Do you have a running motto or mantra or favorite quote? My favorite mantras to mumble during hard runs… With God all things are possible… My pace, my race… And I also like to think of the beer and yummy food I will be consuming after a long, hard run.